FROME Community Trust has announced that applications are now open for grants for community organisations and groups in Frome and the local villages. Players who wish to join the lottery can pick up a leaflet at Frome Library or join through the Trust’s website. Grants are available for any capital project which improves an existing, or develops a new community facility. In recent years, grants have been given for projects ranging from £200 to £2000 and all applications which meet the criteria will be considered by the Trustees. Application forms, which must be returned by Friday 12th April, are available from the Trust’s website – www.fromecommunitytrust.btck.co.uk or from Sue on 01373 462431. 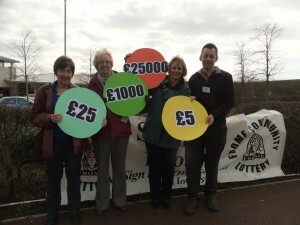 Pictured: Trustees publicising the prize structure of the lottery at a recent event.